Painting Out of the Box! Bubbles are always magical for children. They love the way they float and then disappear and are happy to chase and pop them. Prepare different colours of bubble solution. Bubble painting is done by blowing bubbles onto paper (thicker paper is preferable as it absorbs more water). As the coloured bubbles pop onto the paper a wonderful pattern emerges. Older children can help mix the solutions. Children whose oral motor skills are not yet well developed might need some help or encouragement with blowing. At the same time, this activity can be good for vocabulary-building especially for those learning their first words. You can introduce words like ‘pop’ and ‘bubbles’ to your child. This activity is both simple and fun! Place a piece of paper on a tray (even better if the tray has handles) and squeeze some paint onto it. Drop a few marbles onto the tray and tilt the tray from-side-to-side to make the marbles roll around. Your child can practice holding the handles and watch the marbles as they roll. The children can help to open and squeeze the paint bottles. You can also take this as an opportunity to introduce vocabulary like ‘marble’, ‘squeeze’ and ‘roll’. Alternatively, you can replace the marbles with cars. Parents and children can play together by moving the cars or race to make colourful car tracks! Ready, steady, go! This activity is best with older children. Begin by diluting paint with water. 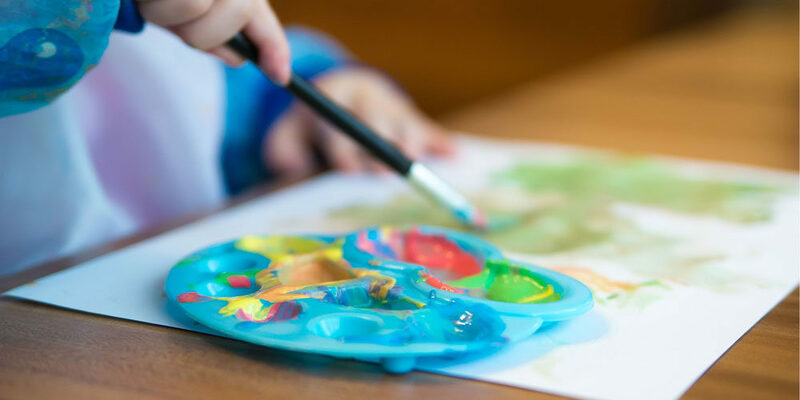 Get your child to spread white glue onto a piece of paper and sprinkle as much salt on top as possible (they can also play with the salt and explore the texture for a while). Remove the excess salt, then use a dropper to squeeze the diluted paint onto the salt (encourage using a tripod grip). The colours will run through the salt and will create a beautiful rainbow when they combine. This activity requires higher-level fine motor skills such as sprinkling and manipulating a brush and a dropper. Since this activity has many steps, you can give your child longer instructions and see if they can follow you. The best thing about these activities is learning while having fun together and also building a stronger relationship with your child!